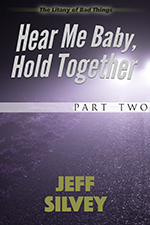 THE THRILLING NEW SERIAL BY JEFF SILVEY—HEAR ME BABY, HOLD TOGETHER. A PSYCHOLOGICAL SUSPENSE TALE FULL OF DARK AND TWISTED TURNS. It’s 1989, in what should be a typical small town in Northern California. But unlike the rest of small town America, this one is right next to a major state prison. And this prison is unlike any other. June Addison has lived in this small town all of her life. However, she is not your average nineteen-year-old Californian. She has burn scars all over the left side of her body, a gash in her right cheek, and an undeniable drive to persevere. One summer night will push her to the edge. What happens next will change her life forever. Tom Quinn is a security guard starting his first day at a bizarre experimental facility. He is just trying to do his job and fit in, but soon he will get much more than he bargained for. Can he endure the horrors he finds there? This novella is the beginning of Hear Me Baby, Hold Together, a mystery and suspense serial that is filled with dark and twisted turns. Buckle up if you dare, and come along for this wild ride.